The FashionBrain project targets at consolidating and extending existing European technologies in the area of database management, data mining, machine learning, image processing, information retrieval, and crowdsourcing to strengthen the positions of European (fashion) retailers among their world-wide competitors. Retailers, such as Zalando SE, often use a relational database management system (RDBMS) to manage their product catalogue, customer data, sales information, etc. At the same time, there is also an abundance of text information available online, e.g. news messages, fashion articles, customers reviews and public fashion discussions. For this reason we developed IDEL (In-Database Entity Linking), a novel architecture in which relational data, text data and entity linking are integrated into a single system. This demonstration shows Tasty feat. IDEL, an extension of the text editor Tasty. Tasty provides interactive Entity Linking during the writing process. 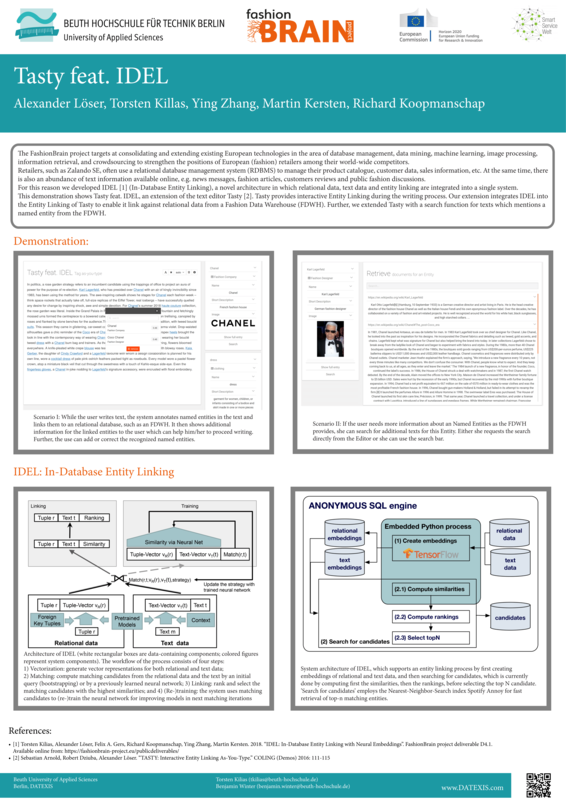 Our extension integrates IDEL into the Entity Linking of Tasty to enable it link against relational data from a Fashion Data Warehouse (FDWH). Further, we extended Tasty with a search function for texts which mentions a named entity from the FDWH.